1. Yadu was the eldest son of king Yayati and his queen Devayani. 2. Yadu had had five sons namely : Sahasrajit (or Sahasrada), Kroshtu (or Kroshta), Nila, Antika and Laghu. 3. Yadu refused to exchange his years of youth with his father Yayati. So he was cursed by Yayati that none of Yadu's progeny shall possess the dominion under his father's command. Thereby, he could not have carried on the same dynasty, called Somavamshi. Notably, the only remaining dynasty of King Puru was entitled to be known as Somavamshi. 4. Thereby King Yadu ordered that the future generations of his would be known as Yadavas and the dynasty would be known as Yaduvanshi. 5. The generations of Yadu had an unprecedented growth and got divided into two branches. 6. King Sahasrajit's descendants were named after his grandson Haihaya and were well known as the Haihayas. 7. King Kroshtu's descendants had no special name, but were known particularly as the "Yadavas", when the original territory was partitioned between Sahasrajit and Kroshta, the former received the part lying to the western bank of the river Sindhu and the latter received the territory situated along the east bank of the river. 8. Several Chandravanshi castes and communities in modern India, such as the Sainis of Punjab Province, Yadav, Jadaun Rajputs, Jadeja, Jadaun, Jadhav, Jadoon (Pathan), and Khanzada have descent from Yadu. 1. King Yadu ordered that the future generations of his would be known as "Yadu" or "Yadav" and the dynasty would be known as "Yaduvanshi". 2. The generations of Yadu had an unprecedented growth and got divided into two branches. 3. King Sashtrajeet's generation came to be known as "Haihai Yadav" occupying the northern regions whereas the King Kroshta's generation became to be known as "Kroshta Yadav' occupying southern regions. 4. King Haihai was Satajeet's son and Sashtrajeet's grandson. 5. King Sashtrajeet instituted a new state and a new dynasty and offered the same, by his own will and against his birth right, to be taken care of by his younger brother Kroshta. Thereby, Kroshta became the heir of King Yadu. 1. 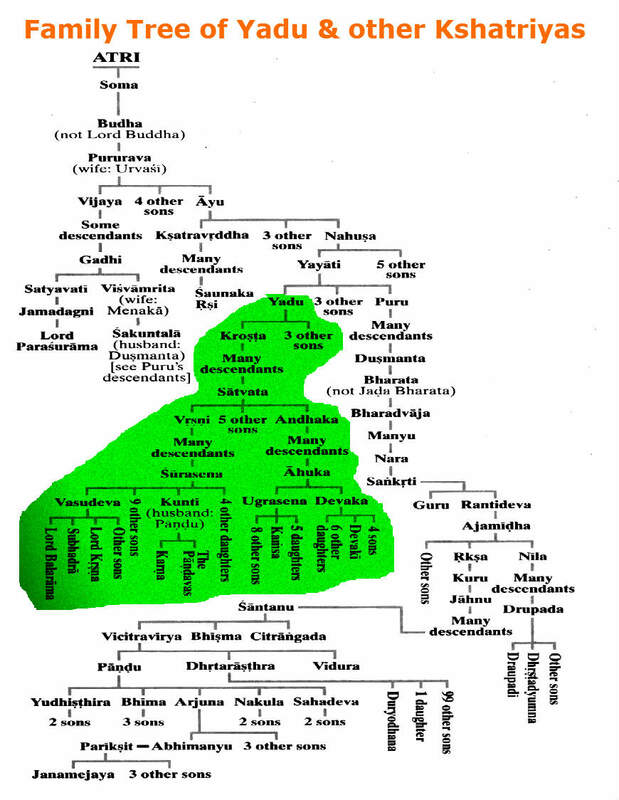 Lineage of Kroshtu grew as follows- Kroshtu, Dhwajnivan, Swati, Rushanku, Chitrarath, Rashibindu. 2. Rashibindu had one lakh queens and ten lakh sons among whom Prithusharva, Prithukarma, Prithukirti, Prithuyasha, Prithujay and Prithushan were prominent. 3. In their lineage later on occurred a king named Jyamadh. 4. He was so dedicated to his wife Shaivya that despite being childless, he did not dare to marry other women. 5. Once, Jyamadh took part in a fierce battle in which he defeated all his enemies. 6. While he was about to return, he heard pitiable cries of a woman. He saw a beautiful young lady who was crying for her protection. 7. Jyamadh was so infatuated by her beauty that he took her to his kingdom. When they reached at the gate of the palace, the king saw that the queen Shaivya was waiting for him along with a big crowd. 8. When Shaivya saw a beautiful young lady sitting beside the king on the chariot, she began to shout at him. The horrified king tried to explain that the young lady was his daughter-in-law. 9. The queen shouted even louder that when they did not have a son, whence the daughter-in-law came. But the king explained that he had selected a wife for her would-be son. 10. As the effect of their conversation queen Shaivya soon conceived and gave birth to a son inspite of her advancing age. They named the son as Vidarbh. 11. In due course of time, Vidarbh got married to that lady whom his father had brought home earlier. 12. They had three sons- Krath, Kaushik and Romapad. 13. Romapad had received preaching from Narada. 14. Lineage of Krath grew as follows- Krath, Kunti, Ghrishti, Nighriti, Dashard, Vyoma, Jimoot, Vikriti, Bheemrath, Navrath, Dasharath, Shakuni, Karambhi, Devrat, Devakshatra, Madhu, Kumarvansh, Anu, Kurumitra, Anshu, Satvak. 15. Satvak was the forefather of a clan that was named after him. Proud to be a YADAV…………………..